7th August 2018 | filed under Aesthetic Treatments. Celebrity lives are inescapable these days. Whether it’s being bombarded with flawless picture after flawless picture on their Instagram pages, or finding out their thoughts on the hot political topics of the day via Twitter. If you have regular access to the internet (or you have an affinity for eavesdropping on conversations on the bus), then chances are that you probably know a little too much about what celebrities get up to, whether you want to know or not. Famous faces crop up in our lives so much it isn’t a surprise that so many people want to emulate them. Celebrities seem to live such fantastical lives of luxury, adored by thousands of fans, and they never seem to age a day. But of course, we all know the secret behind their perpetual lack of aging. No, it’s not because celebrities have access to the fountain of youth; what they do have access to, is state-of-the-art clinics that perform cosmetic treatments and surgery. Today, more celebrities than ever are being open and honest about the cosmetic procedures they have undergone to improve their appearance. Whereas some might still deny the claims made by the media (despite the undeniable evidence of side by side before and after pictures), many celebs have openly talked about their treatments in interviews and online, letting their fans in on exactly what they’ve had done and why. This is very much a welcome change from the usual silence and stigma surrounding these types of celebrity stories. More people than ever are opting for cosmetic surgery nowadays days and the open dialogue created by celebrities is certainly helping to drive this increase. But what types of cosmetic procedures are celebs having done, and how can you achieve their star-studded looks for yourself? Here we take a look at some of the most popular treatments performed on celebs that keep them looking front-page-worthy. Celebrities feel the pressure to look good just as much, if not more, than the rest of us. Given that celebs are often in the limelight, constantly being photographed and filmed, they need to ensure they look their best. Some of the most common ways they do this is by enhancing imperfect parts of their body or, most prominently, by fighting back against the signs of aging, and there are a number of cosmetic procedures that can help to achieve both of these. Probably the most popular and prolific procedure for turning back the clock are anti-wrinkle injections. Anti-wrinkle injections are injections into the skin that are used to correct facial lines and wrinkles by essentially ‘freezing’ the muscles in place; they are incredibly safe when used in small and precise doses. Anti-wrinkle injections can improve the appearance of a person’s crow’s feet, brow lines and forehead lines. It is non-invasive, non-surgical and quick – all aspects that most likely aid their popularity among celebrities and non-celebrities alike. Celebs who have openly spoken about anti-wrinkle injections include Friends’ stars Jennifer Aniston and Courtney Cox; Jenny McCarthy – who openly admitted to getting a top up every two months – and ‘House of Cards’ actress Robin Wright – who also very candidly stated that she believes ‘everyone’ does it. But it’s not just female stars who opt for this kind of treatment, the likes of David Hasselhoff and Simon Cowell have also been very frank about their anti-wrinkle injections use. Cowell even claims that anti-wrinkle injections to him are ‘no more unusual than toothpaste’. It is likely that many, many more celebs have at least tried anti-wrinkle injections in the past if they do not use it on a regular basis. Famous for creating the appearance of fewer wrinkles and smoother skin, anti-wrinkle injections are the single most popular aesthetic procedure in the United States. At Aesthetic Skin Care, our anti-wrinkle injections take between 15 and 30 minutes with minimal side effects and recovery time. If you want to fight the signs of aging and create a more youthful look, anti-wrinkle injections are definitely a treatment worth considering. A treatment that has taken the celebrity world by storm, Fire and Ice Resurfacing is designed to give the skin a youthful look that reduces fine lines and wrinkles, smooths, softens and encourages cellular renewal. This two-step facial is results-driven, resurfacing and treating problematic skin. The treatment works firstly with the ‘Fire’ step. The skin is thoroughly cleansed, and an intensive resurfacing mask is applied that is formulated with glycolic acid, citric acid, lactic acid, malic acid, vitamin B3, retinol and potent antioxidants – the warm and tingly feeling this mask invokes is the reason for its namesake. Once removed, a rejuvenating ‘Ice’ mask is then applied. Soothing and intensely hydrating, this mask contains hyaluronic acid, aloe vera, liquorice extracts, peppermint and grape seed extract. The procedure is quick and fast-acting. It boasts such celebrity fans as Gwyneth Paltrow, Halle Berry, Rosie Huntington-Whiteley, Jessica Alba and Michelle Keegan, among many others. Unlike some other cosmetic treatments, Fire and Ice Resurfacing doesn’t carry a celebrity price tag, and at Aesthetic Skin Care, prices start from just £80! If you want a quick, affordable treatment to revitalise your skin and give you a youthful glow (and one that doesn’t involve needles, if that’s not your thing), Fire and Ice Resurfacing could be right up your alley. There is one cosmetic surgical procedure that is famous for its application in the celebrity world. Rhinoplasty, more commonly known as a ‘nose job’, is a procedure that involves enhancing and improving the appearance of a person’s nose. Often done for aesthetic purposes, it can also be carried out for medical reasons, such as to improve the quality of a person’s breathing. The nose is probably the most important feature of the face in terms of perceived attractiveness. It’s the central focus, and thus a nose which is not aesthetically pleasing can really affect the overall appearance of a person – including giving someone a serious knock to their confidence, if they feel insecure about the way it looks. Nose reshaping can yield results such as a change in nose size and shape, it can be used for straightening the bridge, and resizing the nostrils. If a person is unhappy with how their nose looks, rhinoplasty could really boost their self-esteem and help them be more confident in themselves. A lot of a celebrities have been known to indulge in a nose job, often early on in their careers. High School Musical Star Ashley Tisdale is one such example, having undergone rhinoplasty for a deviated septum. Heading back to the world of Friends, Lisa Kudrow is another star who admitted she got a nose job; she got it back in high school and cited it as being a ‘good change’ for her. Another celeb who praises their decision to get a nose job is The Big Bang Theory star, Kaley Cuoco who claims, along with her breast augmentation, that it was the best thing she ever did. However, once again it is worth mentioning that women are not the only people to opt for this type of procedure. Many male celebs have also gone under the knife to improve the appearance of their nose. Celebrity heart throbs Tom Cruise, Ryan Gosling and Ashton Kutcher have all had their noses enhanced with rhinoplasty, and Patrick Dempsey and Tisdale’s co-star Zac Efron have also been rumoured to have had cosmetic procedures to change the appearance of their nose. Cosmetic surgery has often been cited as something primarily sought out by women. But, as we’ve seen already, male celebrities are just as drawn to cosmetically enhancing their appearance as the ladies. Apart from the likes of anti-wrinkle injections or nose reshaping that we have already mentioned, another popular treatment for these celebs is blepharoplasty – surgery for the eyelids that removes bags, tightens creases and lifts the skin around the eyes. Such star-studded recipients of this procedure include Tom Cruise, Robert Downey Jr and Al Pacino. Facelifts are another popular cosmetic treatment performed to maintain a youthful appearance. Male celebrities such as rock star Steven Tyler have opted for such a procedure, as did American Idol judge Howard Stern, and renowned singer Barry Manilow. When it comes to wanting to retain a youthful look, male celebrities are just as likely to seek treatments as their female counterparts, and because increasingly more male celebrities are opening up about their experience with cosmetic surgery, men all across the world can benefit from this. 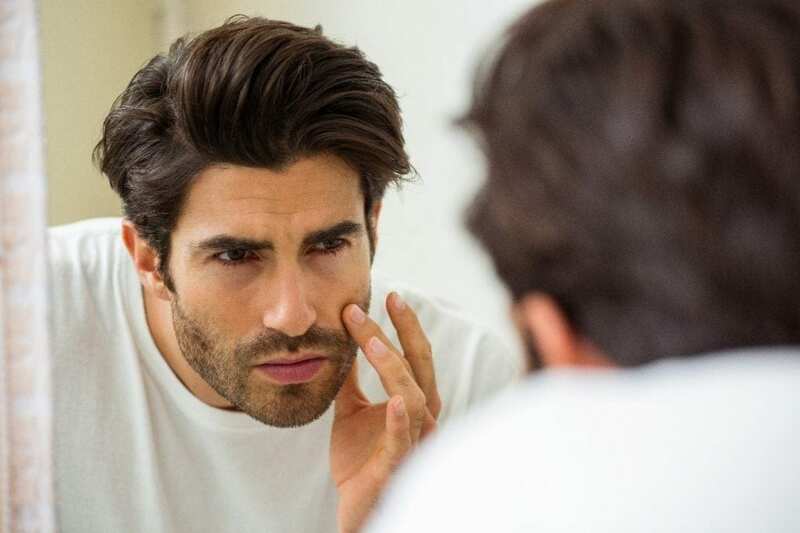 There is often a stigma surrounding men having insecurities about the way they look, and this stigma may prevent many men from seeking out treatments that could help them become more confident in themselves. Admirable celebrities talking frankly about their body issues and the steps they’ve taken to remedy this could encourage more men to undergo cosmetic treatments that they otherwise may not have had the confidence to seek out. Celebrity looks may seem unattainable, but that could not be further from the truth. Whilst some may be blessed with natural, striking good looks, others have shown time and time again that they are not averse to getting cosmetic help in order to look great and achieve a front-page-worthy look. At Aesthetic Skin Clinic, we have a large selection of surgical and non-surgical procedures that can help you appear more youthful or enhance areas of your body that you are perhaps not as happy with as you would like to be. Aesthetic Skin Care clinics offer a broad and sophisticated range of aesthetic procedures that are safe, efficient and effective. We are committed to helping our customers feel more confident and happy in the way they look. If you’re looking to create that celebrity style, look no further than Aesthetic Skin Clinic. For popular procedures such as rhinoplasty in Guernsey, Jersey and Belfast, please do not hesitate to get in touch; we would be happy to assist you.